Manufacturer of a wide range of products which include double girder i beam type underslung eot crane, single girder i beam type underslung eot crane, single girder under-slung crane and underslung eot crane. Double Girder I Beam type Underslung EOT crane is used in the application of lifting the heavy loads which may weigh up to 10 T and also for transporting such heavy weights including the span of 30m and more than that. This Double Girder I Beam type Underslung EOT crane is compatible with wide pans and heavy weights. 2 torsion free box grinders, EOT Girder Cranes handling material, travelling EOT Cranes can withstand heavy loads. So, these double EOT Cranes are useful in lifting heavy loads that cannot be done by normal cranes. 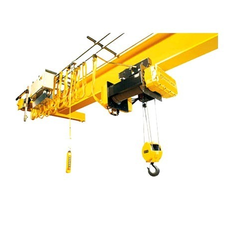 Single Girder I Beam type Underslung EOT Crane for manufacturers can be a great investment as they are necessary and expensive, and the cost cannot be avoided. 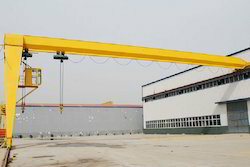 Therefore, before deciding the seller of these cranes it’s important to note that the cranes should be of high efficiency, long working life, easy assembling and most importantly cost efficient. The advantage of Single Girder I Beam type Underslung EOT Crane is that these cranes are robust, have a high tensile strength and an optimum tolerance level. Our company is reckoned for its ability of manufacturing, supplying and exporting a sturdily constructed range of Single Girder UNDER-slung Crane.Our range can be customized according to the demands of our valuable clients. Optimum design of the structure that avoids dead weight and reduces the cost of the equipment. We provide Underslung EOT Crane that is also known as transfer cranes and are used to transfer loads form one bay to another.This type of load movement is not possible with the conventional top running EOT cranes. Transferring the loads directly from crane to crane or by fixed transfer sections, these cranes are appreciated for optimum lifting capacity.